According to the U.S. Bureau of Labor Statistics (BLS), hedge fund managers are a type of financial analysts who are responsible for planning, directing, or coordinating investment strategy or operations for a large pool of liquid assets supplied by institutional or individual investors. They manage investment funds in order to maximize return on client investments, choose particular investments for purchase by an investment fund and also monitor financial or operational performance of individual investments. Developing or implementing fund investment policies, performing research and presenting investment information are some of the other tasks that these professionals perform. Why Pursue a Career as a Hedge Fund Manager? Employment for financial analysts including hedge fund managers is expected to grow between 2012 and 2022, according to the BLS. Hedge fund managers (portfolio managers) are among the Best Jobs in America list by CNN. How to Be a Hedge Fund Manager? Hedge fund managers generally hold a bachelor's degree or higher and also have several years of experience as a financial analyst. Students who are interested in becoming hedge fund managers can pursue a bachelor’s degree in finance or related concentrations such as accounting, economics, or business administration. Taking classes in statistics and advanced math can also be useful. Earning an MBA in finance can also be suitable for aspiring hedge fund managers. Covering advanced courses in hedge funds, asset management, options pricing and bond valuation, these programs may take 2-3 years to complete. What Knowledge Must Hedge Managers Possess? What Skills Should Hedge Fund Managers Have? Communication – Hedge fund managers should have strong communication skills. They must be active listeners and be able to pay complete attention to what other people are saying. Besides, they should also be able to communicate their ideas verbally as well as in the written form. Problem solving – Hedge fund managers must have the ability to solve problems and review related information so that they may develop and evaluate options and implement solutions. Decision making – Critical to this line of work is decision making skills. Hedge fund managers should be able to take into account the relative costs and benefits of potential actions in order to choose the most appropriate course of action. Critical thinking – Portfolio managers must also demonstrate critical thinking, using logic and reasoning in order to categorize the strengths and weaknesses of alternative solutions, conclusions or approaches to problems. To rise to the top, hedge fund managers must demonstrate superior analytical skills and initiative, and be detail-oriented. Pursuing certification may also help these professionals improve their career opportunities. Some hedge fund managers opt to earn the Chartered Financial Analyst (CFA) designation offered by the CFA Institute. To be eligible for the CFA title, students need to complete formal training and also have work experience. Besides, candidates are required to pass 3 exams, covering a range of subjects such as professional ethics, risk management and portfolio management. Where do Hedge Fund Managers Work? Many of these professionals work at large financial institutions based in New York City or other major financial centers, the BLS also noted. In 2012, about 45% of financial analysts worked in finance and insurance industries. According to the BLS, career prospects for financial analysts including hedge fund managers look positive in the years to come. Employment of these professionals is expected to grow at the rate of 16%, which is faster than the average for all other occupations between 2012 and 2022. Investment portfolios are becoming more complex, and there are additional financial products available for trade, which is likely to spur the demand for financial analysts such as hedge fund managers. In addition, emerging markets are providing new investment opportunities that call for the expertise of these professionals. The median annual wage for financial analysts in 2012 was $76,950 (BLS). The BLS also cites that in 2012, financial analysts that worked for industries such as securities, commodity contracts, and other financial investments and related activities earned more than those who were employed by other industries including professional, scientific, and technical services, credit intermediation and insurance carriers and related activities. 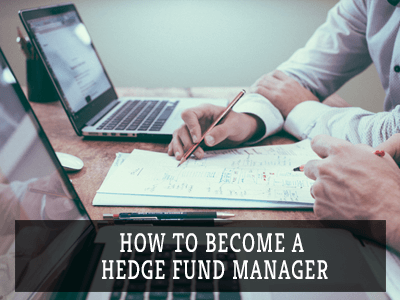 How to become a Hedge Fund Manager in Texas? To become a hedge fund manager in Texas, you will require at least a Master’s degree in finance, accounting or business administration (with a major in finance). You can also obtain a CFA/CAIA certification. Earning Bachelor’s and Master’s degrees will take you between 5-6 years after which you will have to work for 3 to 6 years as an analyst and senior analyst before moving into a management position. How to become a Hedge Fund Manager in California? In order to build a career as a hedge fund manager in California, you need to get a Master’s degree in business administration, accounting or finance. If not, then you can choose to go for a CFA/CAIA certification. You will need between 5-6 years to get Bachelor’s and Master’s degrees and then will have to work for about 5 years or more as an analyst and senior analyst before becoming a hedge fund manager.